PostgreSQL is probably the most advanced database in the open source relational database market. It was first released in 1989, and since then, there have been a lot of enhancements. According to db-engines, it is the fourth most used database at the time of writing. In this blog, we will discuss PostgreSQL internals, its architecture, and how the various components of PostgreSQL interact with one another. This will serve as a starting point and building block for the remainder of our Become a PostgreSQL DBA blog series. You need to access very large (tens, hundreds of gigabytes) buffers quickly. You should minimize contention when many users access it at the same time. The WAL buffer is a buffer that temporarily stores changes to the database. The contents stored in the WAL buffer are written to the WAL file at a predetermined point in time. 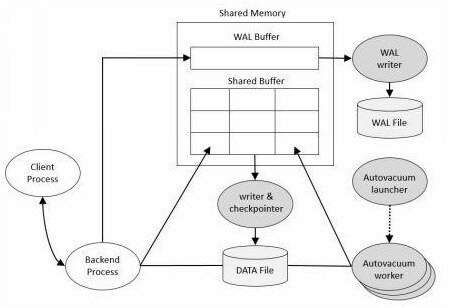 From a backup and recovery point of view, WAL buffers and WAL files are very important. PostgreSQL has four process types. logger Write the error message to the log file. checkpointer When a checkpoint occurs, the dirty buffer is written to the file. writer Periodically writes the dirty buffer to a file. wal writer Write the WAL buffer to the WAL file. archiver When in Archive.log mode, copy the WAL file to the specified directory. stats collector DBMS usage statistics such as session execution information ( pg_stat_activity ) and table usage statistical information ( pg_stat_all_tables ) are collected. work_mem Space used for sorting, bitmap operations, hash joins, and merge joins. The default setting is 4 MB. Maintenance_work_mem Space used for Vacuum and CREATE INDEX . The default setting is 64 MB. Temp_buffers Space used for temporary tables. The default setting is 8 MB. 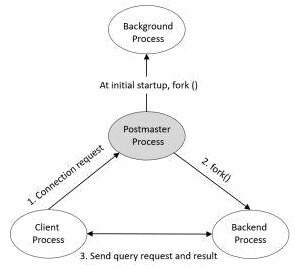 Client Process refers to the background process that is assigned for every backend user connection.Usually the postmaster process will fork a child process that is dedicated to serve a user connection. Here are some things that are important to know when attempting to understand the database structure of PostgreSQL. PostgreSQL consists of several databases. This is called a database cluster. When initdb () is executed, template0 , template1 , and postgres databases are created. The template0 and template1 databases are template databases for user database creation and contain the system catalog tables. The list of tables in the template0 and template1 databases is the same immediately after initdb (). However, the template1 database can create objects that the user needs. The user database is created by cloning the template1 database. The pg_default and pg_global tablespaces are created immediately after initdb(). If you do not specify a tablespace at the time of table creation, it is stored in the pg_dafault tablespace. Tables managed at the database cluster level are stored in the pg_global tablespace. The physical location of the pg_default tablespace is $PGDATA\base. The physical location of the pg_global tablespace is $PGDATA\global. One tablespace can be used by multiple databases. At this time, a database-specific subdirectory is created in the table space directory. Creating a user tablespace creates a symbolic link to the user tablespace in the $PGDATA\tblspc directory. There are three files per table. One is a file for storing table data. The file name is the OID of the table. One is a file to manage table free space. The file name is OID_fsm . One is a file for managing the visibility of the table block. The file name is OID_vm . The index does not have a _vm file. That is, OID and OID_fsm are composed of two files. If you query the pg_database view after initdb() , you can see that the template0 , template1 , and postgres databases have been created. 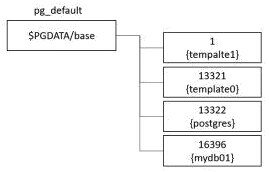 Through the datistemplate column, you can see that the template0 and template1 databases are database for template for user database creation. The datlowconn column indicates whether the database can be accessed. Since the template0 database can’t be accessed, the contents of the database can’t be changed either. The reason for providing two databases for the templateis that the template0 database is the initial state template and the template1 database is the template added by the user. The postgres database is the default database created using the template1 database. If you do not specify a database at connection time, you will be connected to the postgres database. The database is located under the $PGDATA/base directory. The directory name is the database OID number. 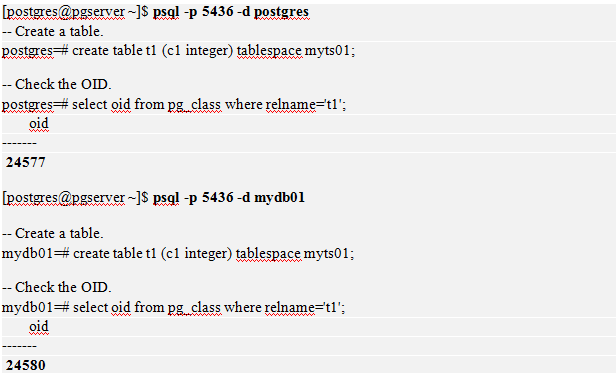 If you query pg_tablespace after initdb (), you can see that the pg_default and pg_global tablespaces have been created. The pg_global tablespace is a tablespace for storing data to be managed at the 'database cluster' level. The location of the pg_global tablespace is $PGDATA\global. The pg_tablespace shows that the myts01 tablespace has been created. 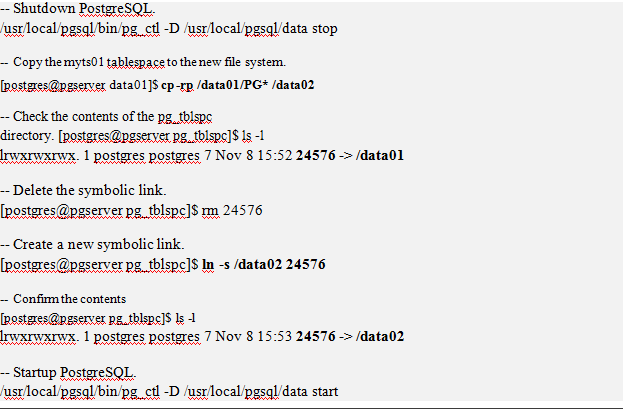 Symbolic links in the $PGDATA/pg_tblspc directory point to tablespace directories. Connect to the postgres and mydb01 databases and create the table. If you look up the /data01 directory after creating the table, you will see that the OID directory for the postgres and mydb01 databases has been created and that there is a file in each directory that has the same OID as the T1 table. PostgreSQL specifies a directory when creating tablespace. Therefore, if the file system where the directory is located is full, the data can no longer be stored. To solve this problem, you can use the volume manager. However, if you can’t use the volume manager, you can consider changing the tablespace location. The order of operation is as follows. Note: Tablespaces are also very useful in environments that use partition tables. Because you can use different tablespaces for each partition table, you can more flexibly cope with file system capacity problems. To increase concurrency, you must follow the principle that "read operations do not block write operations and write operations should not block read operations". To implement this principle, a Multi Version Concurrency Control (MVCC) is required. ORACLE uses UNDO segments to implement MVCC. On the other hand, PostgreSQL uses a different way to store previous records in a block. It uses the transaction XID and xmin and xmax pseudo columns for transaction row versioning. PostgreSQL does not provide a shared pool. This is somewhat embarrassing for users familiar with ORACLE. Shared Pool is a very important and essential component in ORACLE.PostgreSQL provides the ability to share SQL information at the process level instead of the Shared Pool. In other words, if you execute the same SQL several times in one process, it will hard-parse only once. Thanks for reading and stay tuned for the next installment in this blog series. Chitij Chauhan is a seasoned database professional having expertise in various proprietary and open source databases ranging from Ingres, PostgreSQL, Greenplum, Oracle, Sybase, Vertica, MonetDB, Vectorwis, MemSQL, DB2 and Teradata. He is a leading expert in the area of database security, with expertise in database security products such as IBM InfoSphere Guardium, Oracle Database Vault, Imperva and MyDiamo. Prior to joining Severalnines he was working as a solution architect for CitiBank on Ingres, MemSQL and Greenplum database technologies.